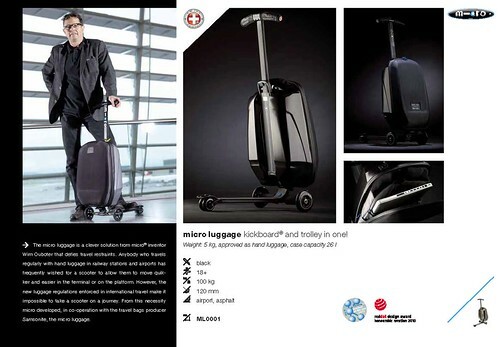 The Micro Luggage suitcase from Micro Mobility Systems in Germany combines the function of a scooter with a suitcase (I guess you could call it a scootcase). It’s probably especially useful when you’re faced with a tight connection and you have to transfer between distantly separated gates. great idea, but at 5kg, thats more than half of the “allowed” carry on weight of some European carriers. I know Lufthnasa is fairly strict with their carry on weights. Would love to see a soft sided bag, that would free up some weight. So the prick who took up the whole overhead bin, is now going to run over me in the terminal, great. That is definitely a creative (and ridiculous) idea!